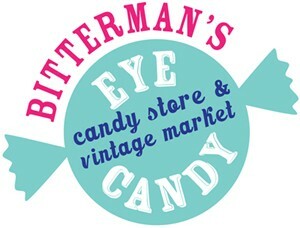 Bitterman's Eye Candy and Vintage Market – Delicious candy and wonderful vintage shopping! 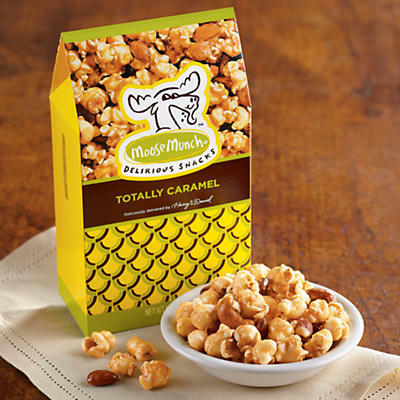 Moose Munch® is the ultimate gourmet popcorn snack. Our gourmet popcorn is lovingly made in our kitchens, specially designed to mix everything just right. Combine this with our top quality chocolate and you get the gourmet popcorn flavors you’ve come to love with Moose Munch®. Choose from a variety of gourmet gift baskets that also include this wonderful gourmet caramel popcorn. OR Call us at: 816-531-3107 for all of your candy needs. The candy with real bugs – not really, but still very neat & delicious! These crazy candies have a Real scorpion inside! The Scorpion Sucker has a genuine and safely edible scorpion that is marvelously encased in a delicious hard candy sucker. These suckers come in blueberry, banana, apple, and strawberry flavor. When you get through the Jack ‘O Lantern printed foil wrapping on our super cute Milk Chocolate Caramel Bumpkins, you’ll find a delicious ball of milk chocolate with a smooth ball of rich caramel waiting inside for you to indulge on! Order online today at: http://www.bittermancandy.com OR Call us at: 816-531-3107 for all of your candy needs. “The Skeleton Dance” is a fun action song that teaches toddlers to name different bones in their bodies. Many of us grew up knowing part of this song but we didn’t learn the chorus, which is about a dancing skeleton. Remember “the leg bone’s connected to the knee bone”? That’s this song! This version comes from Super Simple Songs, which is a fantastic YouTube resource for children’s music. In addition to teaching the names of different bones, the actions in this song also reinforce directions (right, left, up). The munchkin and I learned “The Skeleton Dance” this afternoon and it’s already becoming a fast favorite. Another great activity for you is once you get done having fun singing, dancing, is to chow down on these great skeleton bones candy that we have. What a great halloween gift, treat, and way to incorporate it into any halloween activity that you may have planned. No other candy can match the creamy taste of candy corn, a sweet Halloween favorite for more than a century. Read the history of the Halloween treat, fun candy corn facts, and ways to use the popular candy as decoration rather than just as a low-calorie snack. Every Halloween countless party-throwers, party-goers, and trick-or-treaters hit the streets to harvest candy corn. The little yellow, orange, and white treat is an icon among the holiday candies and has a legacy that goes back more than a century. According to oral tradition, George Renninger, a candymaker at the Wunderlee Candy Company in Philadelphia, invented the revolutionary tri-color candy in the 1880s. The Goelitz Confectionery Company brought the candy to the masses at the turn of the 20th century. The company, now called Jelly Belly Candy Co., has the longest history in the industry of making candy corn — although the method has changed, it still uses the original recipe. Candy corn starts as a mixture of sugar, fondant, corn syrup, vanilla flavor, and marshmallow creme. This mixture is melted into liquid candy, called slurry, and is colored and run through a cornstarch molding process to create each kernel. Wooden trays filled with cornstarch are imprinted with rows of candy corn molds where the layers are individually deposited from bottom to top. The mixture cools in the tray, which seals the three layers together. The kernels of candy corn are sifted from the trays and polished in large drum pans with edible wax and glaze to create its irresistible, hand-grabbable shine. For Thanksgiving, serve Indian corn, which is brown, orange, and white — the brown section is chocolate-flavored. Christmas-inspired Reindeer corn is green, white, and red. Cupid corn is pink, red, and white for Valentine’s Day. Dried apples are great for snacks and lunchboxes. You can also toss them into a spinach salad with nuts and grapes, serve with roasted pork or alongside a sandwich as you would chips. Preheat oven to 225°F. Slice apples as thinly as possible, about 1/8-inch or thinner (use a mandolin if you have one). Arrange slices in a single layer on 2 baking sheets lined with parchment paper. Sprinkle with cinnamon if using. Bake 1 1/2 hours; flip slices and continue baking 1 1/2 hours longer or until completely dry and crisp (they will not crisp more upon cooling). Timing will vary depending on the moisture content of the apples and the thickness of the slices. Let cool. Store in an airtight container up to 1 week. Please visit us at: http://www.bittermancandy.com OR Call us at: 816-531-3107 for all of your candy needs. Chomp down on these delicious chocolate covered gummy bears. Encased in milk chocolate, the gummy bears combine two mouthwatering treats in one – a gummy surprise under a sweet layer of chocolate! When you take a bite, you’ll discover clear gummi bears covered in amazing chocolate. Let us know what you think of them and we will get you 15% off on website store. When do sour gummy worms melt? Since it is supposed to be in the mid to uppder 90’s all week, we thought we put to test on when do sour gummy worms melt? We all know chocolate can melt quickly and is something that will be able to dissolve rather fast. But what about other candy? What about Sour Gummy Worms? We put this hypothesis to the test here at the Bitterman Family Confections Lab and came up with a conclusion. Sour gummy worms melt when they are placed near areas of high heat. Yes, they would melt fully over the stove (with the coating sugar completely melting) but they can also melt when they are placed in sunlight- e.g if you leave them in the car- the worms start to melt and stick/connect to one another, although when this happens the sugar coat doesn’t dissolve. Your worms would not necessarily be ruined and are still editable if you accidentally did place them in your car for a longer period of time; it would still be editable. You would just be eating multiples of sour gummy worms because they are stuck together. So word to the wise, keep your sour gummy worms at room temp to fully enjoy and have that puckering cheek feel. Let us know what other things you would like us to put to the test. Dried fruits and nuts have many health benefits. They are tasty, easy to prepare and transport. They satisfy both sweet and salty cravings and can be added to food for extra flavor. Fruits and nuts are full of nutrients, and unless you buy salted nuts, have almost no negative ingredients. When sticking to a serving size, they are virtually the perfect snack. The most common dried fruits include raisins, apricots, dates, apples, plums and figs. They can be bought at almost any grocery store. According to the University of Nebraska Cooperative Extension, almonds, hazelnuts, pecans, peanuts, walnuts, pistachios and some pine nuts have the highest nutrient value. The nuts are rich in oils, but do not exceed five grams of fat per 50 oz. serving. Various nuts can be bought fresh from farmers markets. Buy raw and unsalted nuts for optimal health benefits. Nuts contain omega-3 fatty acids which help lower bad cholesterol and raise good cholesterol. This can reduce the risk of Type II diabetes and blood lipid disorders. Nuts are a good source of vitamin E, which can reduce risk of Alzheimer’s, cardiovascular disease and cancer. Peanuts and other legumes have niacin, folate and vitamin B, which reduce the risk of heart disease and birth defects. Pine nuts, peanuts and almonds have between 6 and 7 grams of protein per 1 oz. serving. Dried fruits have high amounts of fiber, vitamin E, vitamin A and niacin. The United States Food and Drug Administration recommends that adults and teenagers get three and a half to six and a half servings of fruits or vegetables per day. Children age five to 12 need 2.5 to 5 cups per day. These ranges are based on sedentary to active lifestyles. Dried fruit contain fiber, and the USDA recommends adults consume at least 25 g per day. One ounce of walnuts meets the RDI for omega-3 fatty acids. According to “The Wall Street Journal: Health,” eating 1.5 oz. of nuts per day reduces risk of heart disease, but 2.5 oz. significantly lowers triglycerides and cholesterol levels. Dried fruit and nuts make a delicious snack between meals. Their combination of protein and carbohydrates will satisfy body fuel needs and help you stay full. They are very portable, so pack a baggie full of them and keep it in your purse or car so they are always available. Add nuts and dried fruit to a salad for extra flavor. They can even be a topping on ice cream, or for a better option, frozen yogurt. It’s a healthy alternative for satisfying that sweet craving. Please visit us at: http://www.bittermancandy.com OR Call us at: 816-531-3107 for all of your candy needs and healthy snack needs. 1. After popping the popcorn, put it in a large greased bowl and keep it warm in a 250˚ F. oven. 2. Oil a large fork and set aside. 3. In a heavy saucepan combine the corn syrup, vinegar, and salt. 4. On medium heat, and stirring occasionally cook until the syrup reaches the hard-boil stage (250˚). 5. Remove from heat and add the vanilla. 6. Slowing drizzle the syrup over the popcorn, tossing with the fork until it is well distributed. 7. Quickly, add the Jelly Belly beans and toss until mixed with the corn. 8. As soon as the mixture is cool enough to handle, spread some butter on your hands and quickly and gently shape it into 3-inch balls. 9. Let them stand on some wax paper until they are cool and no longer sticky. 10. Cut a 4” x 7” rectangle of wax paper and wrap a popcorn ball bringing together the long sides. 11. Twist wax paper and tie each end with a green or red bow. Store them at room temperature. Recipe only makes about 10 popcorn balls. Get a 15% OFF COUPON (valid only on website) when you share with us what you did with your Jelly Beans Green Apple.